Soy Not Oi 2 is a new project to celebrate the 25th year of the infamous Soy Not Oi Cookbook and to pay tribute to our dear friend Joel Olson who passed in 2012. 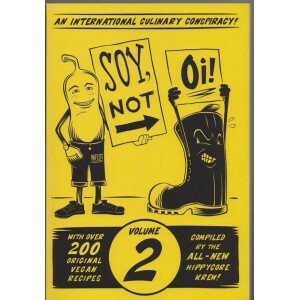 "Soy Not Oi 2 is a new project to celebrate the 25th year of the infamous Soy Not Oi Cookbook and to pay tribute to our dear friend Joel Olson who passed this year. 100% of profits will go to his wife and children. Cast off the chains of corporate food dependency! Twenty-five years after the publication of the original Soy Not Oi, the Hippycore Krew returns with a second volume featuring a worldwide cast of contributors! 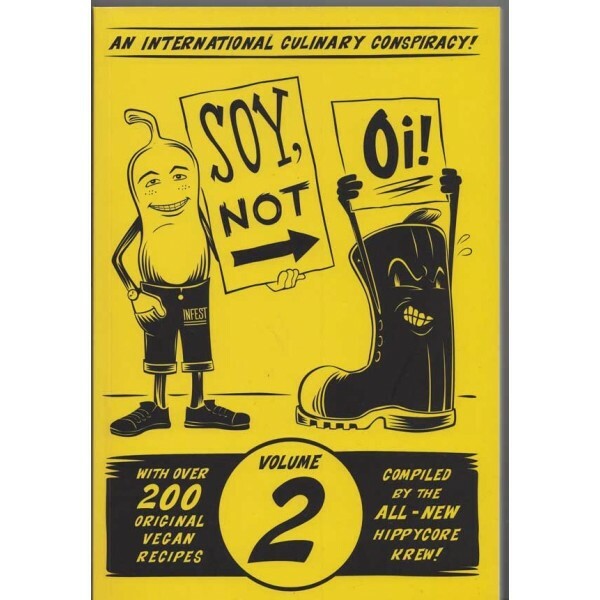 The new Soy Not Oi is filled with over two hundred original vegan recipes, over 100 original drawings of anthropomorphic vegetables gone mad, and suggested musical accompaniments. Plus: essays and articles about the origins of Soy Not Oi and living la vida loca vegan style; a whole chapter on craft beer brewing; inside ribbings, zaniness, and all the rest you would expect from the Hippycore Krew." This Active Distribution UK edition has a £8 cover price. In the interests of complete disclosure, one of my recipes is in this book, but I have to tell you, this book is 311 pages, and I don't get paid a cent if you buy it. Mine is only one of an unbelievable number of delicious and original recipes thought up by folks like me who love to cook vegan style and were willing...nay, happy!... to donate a favorite recipe in Joel Olson's honor. I love the way the book is structured, beginning with the traditional Preface/Thanks and a Foreword but then moving into Introductory Essays by the Hippycore Krew (that edited and compiled the book). We then move from Staples and Foundations into Breakfast and an entire day's opportunities to eat, finally getting to Desserts and...how cool is this?! Brewing! Because every day should end with a homemade fermented beverage and a big slice of sourdough bread! There's a chapter near the end devoted to Fun Stuff like recipes for natural Antifungal Foot Powder and Lip Balm. The book winds down with a Memoriam to Joel, an Afterword, and finally Biographies of the Hippie Core Krew. You will love this book! Not only was it compiled in the true spirit of altruism, but it contains loads of awesome recipes and essays and is just plain fun to read!